January is turning out to be a difficult month in which to find things to write about. (And that turned out to be a difficult sentence.) My plants aren't doing much, and don't require much in the way of care besides watering. Since I don't like to drive in bad winter weather, I'm not out and about as much, going to nurseries, conservatories and such. These trips often provide inspiration, even if I don't write about them in a literal way. So I figured that I could share a few anecdotes that wouldn't make up a whole post in and of themselves. Years ago, shortly after I bought it, my Aspidistra elatior developed an infestation of some sort of soft scale insects. They washed off easily with soapy water, or with an alcohol spray, but they always returned. I had recently been reading about horticultural oils, so I decided to experiment. I sprayed the leaves of the plant with PAM®, the cooking spray. This actually worked in a sense, because the scale never came back. However it took months of frequent washing before I got rid of the nasty, sticky, oily residue the spray left on the leaves. It would seem like I had gotten it all, then I'd come back and they'd be sticky again. (Not unlike what was happening with the scale, now that I think of it.) I'm surprised that the plant survived. It's roughly 10 years old at this point, and has had numerous ups and downs, but it always rebounds. Aspidistra elatior, and Aspidistra elatior variegata. The plain-leaved plant is the one that survived the oil spray. I learned that even if it is called "Cast-Iron Plant" it shouldn't be treated like a frying pan. My beast of a Monstera deliciosa is actually two plants in one pot, consisting of the original plant grown from seed, and a second plant produced from a cutting of the original. There was another cutting that didn't take permanently; it rooted, but rotted out shortly after I planted it in the soil. The nice surprise was that after taking that failed cutting, the original plant produced two new growing points that have both continued to put out new leaves. So I got the benefit of having a third plant in the pot, anyway. I had been under the impression that vining Aroids do not branch, but continue after cutting with a new, single header. Around the same time that I was spraying cooking oil on my Aspidistra, I was attempting to grow some plants from seed. One type that germinated surprisingly well was Philodendron bipinnatifidum (aka P. selloum.) So I had a whole bunch of seedlings growing tightly sealed under a plastic dome (the kind that rotisserie chickens come packaged in) in 100% humidity. They all had one or two sets of true leaves, which were scalloped just like the immature foliage of larger plants. So cute. So what do I do? I take the dome off, intending just to leave it off for a few minutes for air circulation. But I got distracted by who knows what, and when I came back, all my seedlings had collapsed beyond recovery. Sigh. I never tried Philodendron seeds again. My current P. bipinnatifidum was bought as a small adult plant. I expect that I will be making more posts like this from time to time, as life among the leaves is full of amusing/appalling/surprising mini-moments. Aspidistra elatior must be made of tougher stuff than A. lurida. I say this because I've recently thrown away my third lurida, following a fairly rapid decline, just like for the first two. I can't think of anything that would have been the same in all three cases, so I have no idea what to blame . . . except for the species. And the season. It was winter in all three cases. Have you ever tried A. lurida? Or does A. elatior fall to pieces over nothing in particular on you, ever? Mr_Subjunctive: I've never had an Aspidistra lurida; I'm not crazy about that type of variegation. Now that I think about it, while they used to offered for sale fairly frequently around here, I never saw an A. lurida that looked particularly healthy, even at the nursery. Maybe that says something about their constitution in general. My plain Aspidistra elatior has never fallen to pieces, though it has done better at times, and worse at times. I've had single leaves yellow for no reason I can see, and I have had occasional spider mite damage. I just cut off the affected leaves, and it recovers in time. I've never had a whole division collapse. Sponging off the leaves, which is fairly easy as long as they don't have PAM on them, has kept it from developing serious spider mite problems. 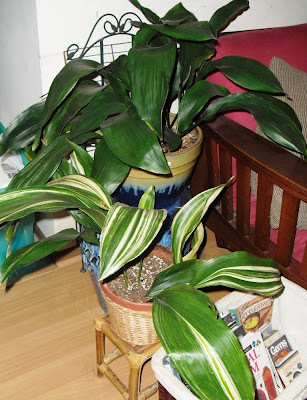 That is my second variegated Aspidistra elatior in the picture. Well technically, it is one small division of my first, potted along with my second. Most of my first A.e.variegata, just kind of withered, basically over nothing. The best I could come up with for that is that white variegation sometimes makes for rather fragile plants. I've noticed that in Dracaenas, Epipremnum 'Marble Queen', and Sansevieria trifasciata 'Bantel's Sensation'. All of this has been an extremely long-winded way of saying I don't know what the hell is up with A. lurida which has yellow variegation, in any case. The luridas at work always looked fine all winter. And I just saw them on Saturday, and they looked fine then, too. (Really good, actually.) Whatever it is, it's something I'm doing (or failing to do) to them, and it's different from what's being done (or not being done) where I used to work. But damned if I can figure out what it is. So that's probably another one for the "never again" list. Oooh - never seen that variegated Aspidistra. I don't think I actually want one, but ... I guess if I saw one for sale, I wouldn't be able to resist just because it's unusual. Fingers crossed for my A. lurida, then.